I wrote this years ago (mid-2009) with a mountaineering audience in mind. It describes the various aspects of paragliding in the mountains, told through the perspective of my first two years flying. Mischief in Patagonia is a great book about Tilman’s 1950’s sailing and climbing voyage in a boat of the same name. Reading it there is a comparison between coastal yachtsmen and ocean going sailors (buggered if I can find it!! ), which reminded me a bit of the parallels between typical paraglider pilots and myself. The gist of it was that while yachtsmen may be more skilful to navigate around coves, inlets and headlands, there is some satisfaction particular to crossing an ocean, and heading off into uncharted territory. 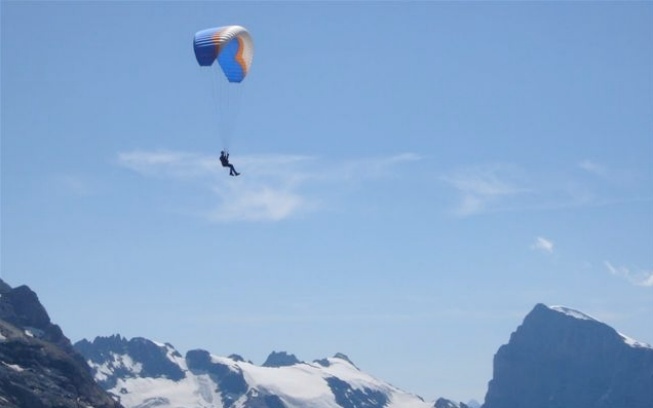 Although I know of several New Zealander’s who became interested in paragliding because of their mountain connections (as I did), the sport is predominantly flying related, and the only climbs anyone would consider involve circling in a thermal. This is a shame because paragliders are perfectly suited to mountain travel. The kit is of similar weight to a rope and a tent, and potentially, could even be substituted for both. It can be packed in minutes and set up is even faster, and with practice take off and landing can be done in very tight spaces. Like Tilman’s yacht, it is a vessel that offers the chance to explore and experience the mountains in a totally different way. And this is why I got into flying. Not because I was fascinated by flight, but because I thought it was a fantastic way to get from A to B, a great way to see the country. It was a very rational desire. First when I did some research on the internet I was amazed at the capabilities of the equipment and how light it was. Next thing I contacted the local paragliding instructor1 and drove down to the coast to chat with him for over an hour… I wanted to know all the details, cost, time, and most importantly, the feasibility of my plans to fly in the Southern Lakes of New Zealand. I was told quite sternly that first I should learn to fly, and put off any mountain flying plans, but yes, evidently, it was possible. The same guy was kind enough to invite me on a trip to India within six months of completing my introductory course. This was a fantastic opportunity, to have a fully organised trip in the company of experienced paraglider pilots, at one of the most renowned sites in the world in the foothills of the Indian Himalaya. But with a little guilt, even leading up to the trip I was more excited about my summer holidays a month after I would return – in fact I was just treating the India trip as “training”2, to give me enough airtime experience to be able to head off on my own. If you haven’t guessed, I spent my summer holidays in the Southern Alps of New Zealand! 1 I highly recommend seeking out a competent instructor for initial training and to master the basics (this includes meteorology and flight theory and a lot of ground handling, especially for mountain take offs). Sea breeze soaring is beneficial at this stage, to practice finer points of glider control. On the day I arrived in Queenstown I couldn’t contain my excitement as I looked across the glassy lake reflection to the peaks, each with a cloud on top. (As a paraglider you quickly develop a sense of tuning your mind to the weather, and this involves a particular obsession with clouds!1) Unfortunately I’d arrived too late to fly, and the next day was too windy, so it was the following day when I finally found myself walking up the peak behind our house, paraglider on my back. Things were damp and there was some cloud about but it was clearing. Having a little trepidation about the invisible (mountains have a reputation for rough air) it was good to start things off in gentle conditions, so this was perfect – light wind and the heat of the sun’s rays dampened out. I launched and was surrounded by the beauty of lakes, hills, rivers, mountains, and the light whooshing of air through the lines. I’d wondered for a long time what this would be like! Everything looks different from the air; it is truly a different world up there. And I think of all aircraft the paraglider must be the quietest with the best views.2 Having had a lovely walk up I was quite content to enjoy the serenity of a peaceful glide back to the house, but as it turned out, half way down I flew into a thermal. I circled and gently climbed back up to launch height. The sun had come out and I soaked in the views with height to spare before landing in the front paddock. Magical! 1 Cumulus or “fair weather clouds” generally indicate the tops of thermals. On a cross country flight, you normally start by circling in a thermal all the way to “cloud base” before gliding to the next cloud / thermal source. 2 I actually got prescription glasses specifically for better views when in the mountains, although you can fly with sunglasses or just the naked eye. I’ve since got laser eye surgery, a great investment. A week and a few flights later I met with three mates from Australia for a tramp up Earnslaw. Having a bit of extra fitness up my sleeve I didn’t mind strapping the glider onto the back of my pack. It definitely was worth its weight! In the afternoon after summiting I excitedly asked some guys at Esquilant Biv what the wind had been like. Well, I couldn’t resist – starting and stopping on a snow patch by the hut I enjoyed a few minutes of bliss – a quick fix – the massive cliffs of the upper Bedford and Earnslaw to my left with the ocean visible behind the divide which lead off to my right. After landing I was delighted to spot a sailplane circling on Pluto1. This memorable flight aside, the glider continued to be of practical assistance. After getting the guys confident with glissading on the descent, I flew the last bit to our bivouac perched below the snowline, since glissading is not possible on tussock! But it was the next morning where it was the most beneficial. I gave my poor old mates a few hours head start, and then meandered uphill, the sun beating on the east facing slopes the whole time. Then I launched and maintaining my height in the buoyant air I flew past dozens of waterfalls, Earnslaw looming large above me and Aspiring clear in the distance, and while my mates slogged through the boggy flats of the Rees I overtook them, flew into the valley to lose my height, landed by the car park, and drove back part of the way to pick them up! There was an inordinate amount of good weather that trip, and I made several other memorable flights. In fact thinking back I wonder if I would have managed to fit as much into the trip as I did if it had not been for the rests I took whilst sitting on my seat in the sky. 1 I’m sure they must have seen me too. It is the first and only time I’ve seen a sailplane out there. Ever not felt like walking down 1000 vertical metres of dripping west coast bush? Or realised that you walked up on the wrong side of a nasty gully? Solution! I was so impressed by that trip that I took advantage of a light work schedule to return again in Easter. As I passed through the mountains naturally I paid close attention to every movement of air, something many paraglider pilots may only do in their car on the way to launch. This sport has definitely made me become more observant as a person. Not to mention giving me a far more intimate knowledge of the weather – well now I know the true meaning of “stability”1. Baking sun on scree slopes in the middle of the day is incredibly no match for a stable air mass – this is the main thing I learnt on this autumn trip. But nevertheless I did have some glides which saved traversing horrible terrain, and I also had some beautiful walk up and fly downs. 1 Hot air rises – if the air beside it is a couple of degrees cooler. Due to reducing atmospheric pressure, air in a thermal cools as it rises, therefore if an air mass doesn’t get colder at altitude it is stable and inhibits thermals. 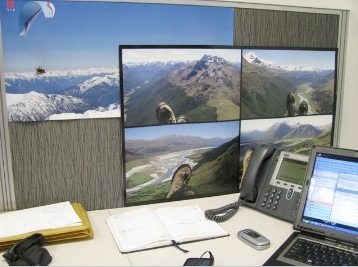 It might have been a mistake putting this up at work..
I’ve found it can be very difficult to concentrate at work when you keep thinking about trips like this – not to worry, it wasn’t long before I was off to Europe – the place where, more than anywhere else in the world, paragliding is a well known and everyday sport. My same mates came on a trip through Switzerland with me and they might as well have been half way up the Landsborough, with their huge packs! The poor bastards lugged their loads up and down over 2500m passes while I (well on a good day anyway) would fly over their heads. At least there was a reason for my big pack. Sometimes I would manage to stay up a while, other times I would glide on down ahead. On one occasion I took off near a 2778m pass, glided in a straight line, and landed in a field near the town 1500 metres below. I had time to check the internet as the storm clouds grew and then went off to get a beer while my mates got drenched in the downpour, still walking down the valley. A memorable Swiss Alps flight. Left - soaring bird is a good sign; Right - it's working alright! A month later I arrived in Nice with plans to vol biv my way up towards Mont Blanc. Vol biv is a great way of combining flying with the mountains – vol meaning fly, biv meaning you don’t have to try and get back to a landing paddock by your tent. 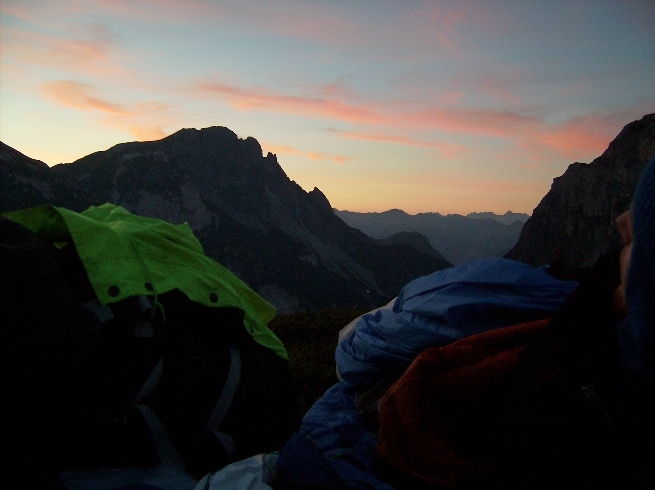 And that is the other great thing about a paraglider – fifty square metres of fabric to keep you toasty warm (just don’t panic if you wake up in the night tangled in the lines!) An ideal day involves walking up to a high point with a good sun facing aspect in the cool of the morning, waiting for conditions to turn on whilst having something to eat, flying along the tops, perhaps landing up high to warm the fingers and have a late lunch, and continuing in the late afternoon and evening before landing in the mountains to rehydrate and look at the map to plan tactics for the next day. Of course what really happens is always a surprise and often frustrating too but this is what keeps things interesting, makes it very much a mental challenge, and ultimately a rewarding and enriching experience. The other great thing about vol biv is you get to meet people and see a side of the country that is really off the tourists’ beaten track – after all, you are dropping out of the sky. The kindness and helpfulness of the people in that part of the world is as good as the food (ok, they might not have decent maps in the tourist information centres, but they’ll at least personally invite you to their homes and assist with getting a map in town the next morning!) This trip was in fact so exciting that I even had trouble sleeping some nights. Another memorable flight I did went so well I didn’t feel I had enough time to appreciate all the scenery on offer… it’s exactly like the trips my Dad always dreamed about, “traversing along the tops” – except a trip of several days takes an hour or two. Almost a year had passed now since that first New Zealand trip. I’d recently met a guy my age from Christchurch who had similar ideas, and we were excitedly planning all kinds of adventure in the hills. All kinds of adventure involving a flexible wing, I should say, and not adventure involving 100km/h norwesterlies! Good for sailplanes, but not for us. Fortunately, unlike some flatland flying sites in the middle of nowhere, you can find plenty of other things to do in the Southern Alps1. In any case we squeezed in some very memorable flights in the backcountry near Queenstown – one near the start of the trip was thrilling2, and I thermalled up just that extra couple of hundred metres of height above the hill that gives you the views of the bigger, more distant peaks you wouldn’t otherwise see. The final flight of the trip after a day walk up a local hill had us soaring away, checking our watches before landing by the car just in time to catch our flight out of Queenstown and back to work. But for now, the much enthused about multi-day-vol-biv-extravaganza will have to wait for another season. I had now well and truly done my apprenticeship on a beginner wing, so the day before I had to head back to work in Canada, my new wing was delivered – all 4.1kg of it! Some would say the couple of kilos saved off a regular wing isn’t worth it, but my usual reply to that is that I spend more time carrying it than flying it so I want it to be light. Along with my new harness that converts into a backpack (3.1kg), and my lightweight reserve parachute (1.1kg), I’ve got a pretty minimal kit. So far it has certainly been working out well – especially initially in Newfoundland (a very windy place), where the best flying to walking / driving ratio I got was about a minute to the hour! But I didn’t mind one bit carrying it for the slightest chance of a fly – in the end, all the emotions of anticipation and frustration are compressed into a few moments of joy. 1 And I think this is the point of this whole article – that with paragliding and mountaineering, the sum is greater than its parts. 2 It was my first flight on a new wing, which more responsive and higher performance than what I was used to (sports class). Wings are classified by their response to collapses or extreme situations – basically the classes are beginner, fun, sport, serial, and competition. After flying a beginner wing nearly two years in the mountains I now have a fun class wing. Across the Atlantic however, France beckoned… I again went to Nice, the starting place for my previous successful vol biv. I wasn’t again lucky to have good “XC” conditions, but the weather was great for walking. After learning the sport, many people concentrate on cross country (XC) flying, which basically means using thermals and flying as many kilometres as you can. The trouble with this is that you are very dependent on weather conditions – light winds, sunshine, good atmospheric lapse rate, inversion to cap overdevelopment (did I say this got technical? )… whereas I was of the mentality that I was already there. While the wind was too strong to go cross country flying I walked off to some quiet mountains and there I had some lovely flying in the local area, enjoying the views and the thermals all to myself. On another couple of days humid air and an unstable atmosphere meant early clouds and afternoon thunderstorms, with flying being possible only early in the morning. While most cross country pilots shun the idea of a “boring” “sled ride” into the valley, it is quite a different thing when you’re starting point is the summit of Mont Blanc! Not to mention arguably a safer1 and much more enjoyable way of getting down. The one favourable thing about the weather forecast was light to no winds at all levels, but despite this I was in disbelief that I could be on the summit at 4810 metres, with France, Italy, and Switzerland thousands of metres below, and there wasn’t a breath of wind. Us paraglider pilots are a very picky bunch, really we would prefer to have even just 3-5 knots of wind, just to be able to effortlessly pick the canopy up and fly it overhead before committing to the launch. But instead it was necessary to “run like the wind” and hope that in the short space of reasonably sloping summit snow you could get the canopy flying overhead. Being Mont Blanc there were plenty of climbers around to help with holding up the canopy and make things a little easier. But I still struggled in the thin air, and on the second attempt the canopy fell in a heap and got quite tangled. I had to step through the lines twice to untangle it, quite a strenuous thing to do at that altitude so I’m glad I got it right (when, with experience, the seemingly chaotic mess of lines starts to make sense, you begin to realize that you are not a normal person anymore!) Luckily the snow gave sufficient traction for stopping without crampons easily and after some time finally I managed to launch, on my third attempt. I yelled out my thanks as I left the mountain and glided effortlessly along the ridge, and then played above a glacier losing height before landing at the hut as wispy clouds formed around me. 1 Modern beginner wings are very safe. Safety is a factor of: pilot skill controlling glider on launch, making good decisions about where and when to fly (understanding the weather in your vicinity), and after choosing a suitable landing, standing up in the harness early (the most common injury is a broken back, caused by people landing badly whilst in a seated position). What does mountaineering mean to me? It means getting away from it all, absorbing the scenery, living the moment, knowing yourself and your capabilities, understanding the environment, a continual assessment of conditions and options, route finding and navigation, and freedom limited only by nature. In these respects paragliding simply adds another dimension to the mountain experience. Unfortunately the sport is struggling somewhat, at least in Australia, as it is demanding and requires a lot of commitment. However, although it is still dependent on weather conditions, the last decade has seen big improvements in safety with stable beginner wings having great performance, and I find that the present advent of light weight equipment means you can bring your kit “just in case”. It really is lending itself to the mountains, and in fact that kind of flying journey is now gaining popularity in Europe. Excuse the pun, but this all just opens up a lot of new horizons. And there is a lot more to explore. 1 I think competition flying is a great way to learn and a great sport in an awesome arena. I would love to become more proficient in this area – but I just want to emphasise the words in Jocky Sanderson’s flying DVD – “the best pilot is the one having the most fun”. Great read and vids, many thanks! Thanks for sharing – that was the best inspirational read I’ve found on the internet for some time!